Sue is an experienced Corporate Director and retired President & CEO of CDSPI, a company providing advisory, wealth management, insurance and health and wellness services exclusively to the Canadian dental community. Sue has over 25 years of experience at the senior executive level in the insurance and reinsurance industries. 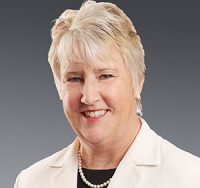 During this time, she served as Senior Vice-President of Swiss Reinsurance Company Canada, with previous roles at CIBC Insurance and Dominion of Canada General Insurance Company. Prior to her senior executive roles, Sue was a senior manager at PricewaterhouseCoopers’ (PwC). 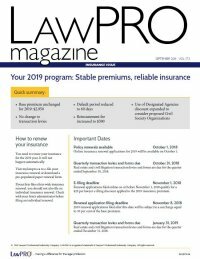 In addition to serving on the Board of Directors of Lawyers’ Professional Indemnity Company (LawPRO), she serves on the Board of Directors of Canadian Premier Life Insurance Company and Legacy General Insurance Company. Previously, she served as director and Chair of the Audit Committee of McGraw-Hill Ryerson Limited, a public company in the educational publishing industry. Sue has also made a long-term commitment to the Canadian healthcare sector. She serves as Chair of the Board of Directors of Michael Garron Hospital and as a director of West Park Healthcare Centre. Previously, she served on the boards of the Toronto Rehabilitation Institute and The George Hull Centre for Children and Families, which she chaired for three years. In recognition of her career accomplishments and contribution to the community, Sue received the FCPA, FCA designation in 2016 from the Chartered Professional Accountants Ontario. She has also earned the ICD.D designation from the Institute of Corporate Directors. Active in organizations focused on networking and executive professional development, Sue is a member of Financial Executives International, International Women’s Forum, Women’s Executive Network and Women Get on Board.